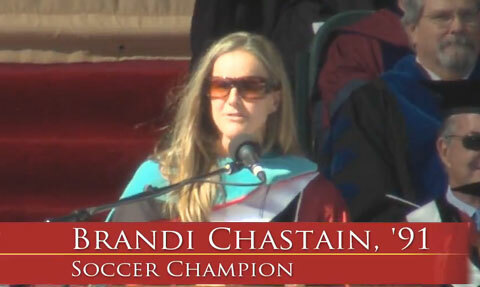 Brandi Chastain was named an All-American twice in soccer during her time as a student at Santa Clara University. She was also the assistant coach for the Santa Clara Broncos from 1994 to 2000 and is currently in her fourth season as a volunteer assistant coach. She is a former member of the United States women’s national soccer team and has won two Women’s World Cup championships, two Olympic gold medals, and an Olympic silver medal. She earned a degree in communication from SCU in 1991. Playing Field Promotions is a booking agent for motivational sports speakers and celebrities. If you would like to book Brandi Chastain for a speaking engagement or appearance, contact Brandi Chastain’s booking agent for appearance & speaker fees or call 1.800.966.1380.